on-line flea markets; & "malls"
Full color catalog $10.00/US; $15/overseas. Canada, etc. 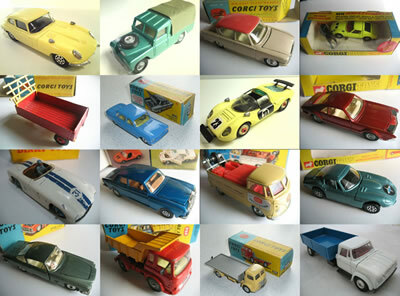 has intermittent auctions [about once every 3 months] of an average 600-800 lots [1-20 pieces] of Matchbox, Dinky, etc., including "rare & unusual" items. "founded by Roger Mazillius  & was originally based on The Isle of Wight, bought by Bryan Goodall, owner of The Hambleton Group, in 1996 & its head office relocated to the north east of England." holds four regular auctions of Toys for the Collector each year since 2002.The next auction is on Saturday 4th April and includes 415 diecast lots (120 Dinky toys lots, 111 Corgi Toys lots, 120 Matchbox lots and 61 various diecast lots).The auction catalogue brochures are available on request at £7.50. Reasonable postage charges worldwide and bids can be submitted by e-mail mail@specialauctionservices.com together with full name, address and telephone number. valuation service (Insurance, Probate, Overseas) free of charge if brought in for verbal estimates & advice, or preliminary estimate from photos. If a valuer calls at your home, usually no charge if subsequently sold through Phillips, otherwise a nominal fee. For Further Information contact +44-171 468 8348, or print out enquiry form from web page above & fax or post it. few offerings seem to be truly MIB, mint or NM. condition is hard to determine from a "good" digital photos & some images on eBay are pretty bad. "sponsored & supported by leading newspapers, antiques & collectibles trade papers & web sites"
"Great news for collectors and modellers - Toy Collector's new Toy Market - the place to buy and sell collectable toys and models online - is now up and running! Grab a bargain to celebrate! "To mark the launch, we've got a raft of vintage Corgi and Dinky toys - all in great shape - up on auction at a start price of less than 50 cents each! (That's £0.25 or 0.50 Euro Cents each for those in England or Europe!) The picture above shows just a few of them - click here to see them all! Superfast listing Through our catalogue ToyPedia - takes just 20 seconds! Lots of free images Up to ten per listing. Free! Find stuff easily! Just use our patented browser to find what you're looking for by category, or use the keyword filter to narrow your findings! Low final value fees Just 8% final value fees on Buy-It-Now and Auction items, plus 8% buyer's premium on auctions - less than eBay's 20%! No payment fees Our Amazon-style integrated payment system means no PayPal and no PayPal fees, just quick, secure, free payments! Safe and fair for both Buyers and Sellers. Our checkout system provides maximum protection to both parties! " toy shops, dealers, collectors, collecting Information etc.